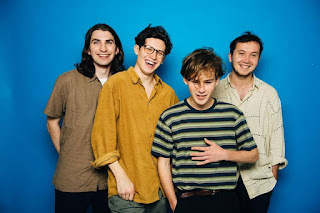 RECENTLY announcing their set for the upcoming NME Awards Tour, Brighton based foursome, The Music Gang have had a whirlwind of a time for their two years together, 2016 should watch out. Touring with the likes of Wolf Alice and with several singles under their belt, The Magic Gang have a solid foundation to build on. With a debut record out on 8th January courtesy of Telharmonium Records, the four lads have offered up a little taster in the form of track, She Doesn’t See. Starting off with a lulling beat, front-man, Jack Kaye's vocalism echoes like Damon Albarn in early Blur records, recreated by the likes of The Vaccines in more recent years. Adopting a 90s Americana vibe, the track throws a multitude of shapes, with the instrumental aching to break through into a sludge-pop almost garage track without verging too much onto Brit Pop territory. The band are currently nearing the end of their tour, however you can catch the rest of the tour dates here.